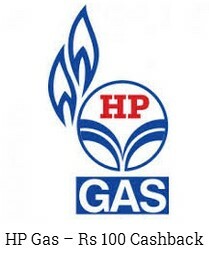 Get Flat Rs.100 Cashback on HP Gas Payment using Scan & Pay with Bharat QR / mVisa. Under this bill payment offer, Eligible users who successfully make payment transaction using Bharat QR/mVisa as a payment option (Each a “Qualifying Transaction”) will receive INR 100 cashback for each qualifying transaction, Subject to the terms and conditions below. It is clarified that users making Bharat QR/mVisa payments may need to check with their card issuing bank to see if their mobile banking application is not enabled for Bharat QR/mVisa transaction. 5. Post successful transaction eligible users will receive transaction confirmation on the App as well as from corresponding issuing Bank from which the transaction has been done. 2. The offer will be held during the period from 1st August 2017 tp 31st October 2017. (both dates included) (the “Offer Period”) or until such time as the maximum limit of qualifying transactions is not reached. 3. The offer is valid for 5000 number of Qualifying Transactions. Once the limit of qualifying transactions ie reached. No further cash backs will be provided and the offer will withdrawn, even if the offer period is still valid. 4. The offer shall be over and above any usual discount that may be provided by HP during the offer period. 5. For the avoidance of doubt, while visa in conjunction this offer TranServ has facilitated this offer for the benefit of eligible users. HP is the sole provider of all goods and/or service. Accordingly, the eligible User understands, acknowledges and agrees that the procurement by him/her of any goods and /or services shall constitute a contract solely between HP and him/her, and mVisa and / or a is not, nor will become, a party thereto. 6. By utilizing or attempting to utilize any of the goods and services, the eligible users understands, acknowledges and agree that. 8. Eligible users shall contact TranServ at the following email address [email protected] for redress in the event of any claim or non-receipt of cash back offer, or benefits or privileges under this offer. 9. Eligible users are not bound in any manner to participate in this offer. Any participation by the eligible users shall be voluntary. The offer is purely promotional in nature and the offer may be discontinued or altered at any time, whether prior to or during the offer period, without prior notice. However, eligible users shall receive INR 100 cashback prior to the day of withdrawal. 10. In addition to the above, the regular terms and conditions of the respective mobile applications used for transaction shall also be applicable unless otherwise stated above. 11. Information about the offer is correct at the time of publication. Eligible users can refer to the latest set of Terms and Conditions as available on HP/Udio’s Website. 12. Should you have any query regarding the offer please contact n at the following email address [email protected] Please note that any queries will be entertained by TranServ only till 45 days from the expiry date of the offer. 2. Udio wallet is issued by TranServ Private Limited and is operated as per the prevailing guidelines issued by the Reserve Bank of India for semi-closed loop prepaid instruments. 3. The Udio card linked to the Udio wallet is a prepaid Visa card issued by RBL Bank in partnership with TranServ. 4. Cashback offered to the eligible users transacted using Udio wallet shall be in the form of Udio Cash.